Disclosure: I received this particular block of cheese from Cabot as a gift, although I also buy quite a lot of it on my own dime. I've been cutting back on grains lately, but that hasn't stopped me from craving cookies and crackers. And then I made a miraculous discovery. 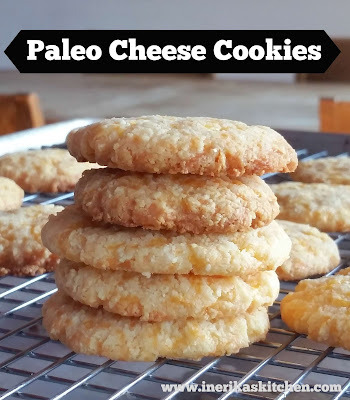 Replace the all-purpose flour in my Parmesan Smoked Paprika Crackers with almond flour or almond meal and you end up with low carb cheese crackers (or cheese "cookies," as I prefer to call them) that are even more delicious than the originals. 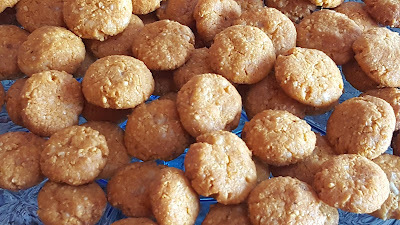 These Almond Cheddar Tea Biscuits are also keto, low carb, gluten-free, grain-free, and the perfect snack for people following a LCHF (low carbohydrate, high fat) way of eating. Here's the basic recipe. I used Seriously Sharp Cheddar from Cabot Creamery, one of my favorites, but you can use any shredded hard cheese - Parmesan, Gouda, Jarlsberg, or any strong cheddar cheese. Feel free to add herbs or spices to suit your taste. Crisp, crumbly and extra cheesy, these easy cheese crackers contain three ingredients and bake for just 15 minutes. A perfect snack for those eating grain-free, gluten-free, low carb or keto. Heat the oven to 350 degrees F. Blend all ingredients together in a bowl with a wooden spoon or hand mixer, or use a stand mixer with the paddle attachment. Mix (aggressively if you're doing it by hand) until a smooth dough forms.Roll 1-inch balls of dough between your palms and place on two lightly greased or parchment-lined baking sheets, leaving about 2 inches between each dough ball. Flatten the balls slightly with your fingers. Bake 15 minutes, or until the edges of the crackers start to brown. Cool 5 minutes on the baking sheet, then remove the crackers to a rack to finish cooling. I could not stop eating these cookies! Perfect for holiday appetizers or everyday mid-afternoon snacks.